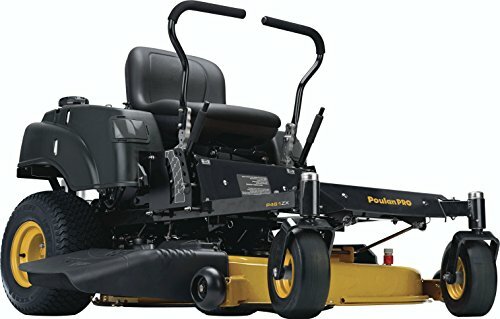 This is a Poulan pro riding lawn mower review is for you to help you make the best decision. Managing your lawn can be an expensive affair if you have to call on a professional to do the work for you. It’s even harder when you have to deal with uneven terrain when using a regular pushing mower. But with a riding mower, you get to achieve total control, and speedy operations even on slopes. In our hunt to bring you the best riding mower, Poulan Pro brand presented innovative designs which deserve a segment of their own. We have come to appreciate the qualities presented by this brand as it brings forth game-changing technology in outdoor equipment. Their mowers are professional, robust and most of all offer a modest investment. Here, we dive into three designs which continue to tick as the best on the market. Although picking just one product for all-around lawn maintenance, we feel that the Poulan Pro P46ZX surpasses most of our expectations. The zero turn radius creates the convenience of mobility. It is ideal for the homeowner who has their land standing out in magnificent trees, flowerbeds and hedges. There’s no need to outsource mowing services when you can have some fun on a riding tractor. Here’s how to make an excellent choice whether you are a novice or run your own lawn care business. The size and area you’ll be covering will guide your choice on the cutting deck. For small and mid-sized areas, you’ll want to look at decks from 28inches to 46inches. Medium duty mowing tasks and vast estates require over 50inches of cutting deck to minimize the time you take. Here you get to choose between a zero turn mower and a steering wheel system. These two types of machines present parallel features when it comes to controlling the tractor. The zero turn is ideal when you have to make narrow passes between fences and the like since it can turn over 360-degrees. The steering mower comes with a particular turn radius. The higher the number, the large space you’ll need when making a turn. Do you want to bag, discharge or mulch the grass clippings? These three cutting methods offer their advantages and disadvantages. If your grass is tall, a side discharge will work best for you. Those that love mowing often, a mulching method will preserve the green of the lawn by regular fertilization. It helps in retaining water; hence your grass becomes drought resistant. Bagging is the shortest way to achieve a super-neat lawn. It saves you from constant mowing since the seeds are not re-injected into the ground. When choosing a bagger, it’s always good to maintain the bagger specifications for future compatibility. This mechanism achieves the fastest drive since it uses fluids to transfer the engine power to the tires. It has easy upkeep as there are fewer moving parts. This method uses pedals like in automobiles to control the wheels. It is easy to master the motions, and it also gives you the advantage of navigation around obstacles. This system uses a clutch to engage the wheels and control the speed. You will have several speeds to choose from to achieve a responsive ride. Continue reading our Poulan Pro riding lawn mower review to find out more about these lawn mowers. To escape the physical demands that come with pushing a mower, invest in the Poulan Pro P46ZX to see a difference in your lawn. This model is all-around in comfort, performance, and durability. It powered by a 22HP Briggs and Stratton engine which speaks of the efficiency of the cutting system. Working with it is effortless, thanks to the zero turn radius which lets you make smooth turns just by moving your hands. This way, you achieve total control in your mowing expeditions. This mower comes with two steel blades which offer a carpet like cut with every pass. It can make a 46-inch path which means you can accomplish a lot in a few hours. It is best for small to medium-sized homes. You can vary the cutting height between 4-inches at the highest and 1.5inches at the lowest. It allows for an even cut in that you can achieve the right grass height to allow for a healthy grass growth. It is pleasing that it produces an even discharge through the side, leaving your lawn sparkly. When it comes to operating this beast, the electric clutch will make it feel delightful. The deck lift is hand-operated; thus you have the control of the cutting height. Along with the lever drive method, maneuvering and making complete U-turns becomes a breeze. It saves you from doing repeat jobs hence you can finish mowing much faster. This machine is equipped with a hydrostatic transmission for high efficiency in the forward and reverse propulsion. You’ll experience a smooth run even when engaging the variable speeds. What’s more, the P46ZX is furnished with large rear tires which measure 18-inches. They are crucial in helping with a smooth ride over hilly areas. You can engage them with the levers which allow quick turning without hiccups. The 11-inch front tires also come in handy to balance the tractor, so it’s not front heavy. From the steel blade to the aluminum spindle and stamped reinforced cutting deck, you can tell you’ll be using this machine for a decent period. The deck is powder coated to protect it from corrosion and abrasion. The seat has a vinyl construction which resists wears from frequent use. It is installed with a high back and is 15inches from the ground. It achieves the correct balance with gravity. Thus it becomes easier to control the tractor. The P46ZX is furnished with a deck wash port. It makes it easy to clean the underside of the deck in quick, easy steps. It comes with a digital hour meter which is handy in tracking how long you have used the unit and when it’s time for service. It makes it easy to keep your mower in good working condition. The P46ZX excels in cutting tough and thick grass over large residential areas. The turn radius is a unique property since it makes it indispensable when covering slight hilly areas. It can mulch well and also acknowledges different accessories like baggers. It leaves a clean look with every pass plus it can last a long time in the best working condition. 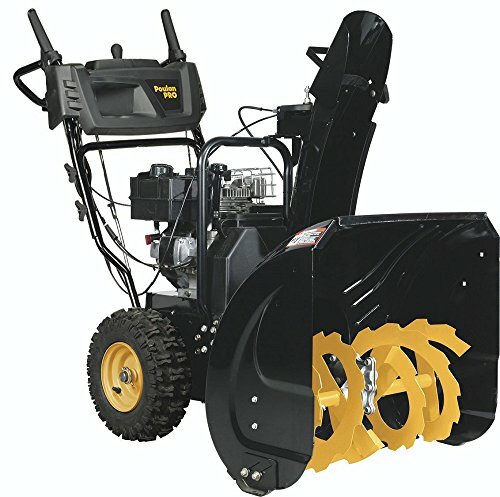 This is the machine to pick when you are on a budget. Only; don’t take it to cover commercial estates as it will feel like a drag. Everyone who has a passion for lawns is trying to get a brushed look. The only machine that is going to give you results is the Poulan Pro P54ZX. It is designed to achieve a 360-degree turn to get you around obstacles fast and easy. This way you will not be leaving out any patches in the process of working; hence the area becomes clean and even without a hassle. This equipment can complete 2.8 acres an hour. You can use it for large residential estates, and it also applies for moderate commercial jobs. The 54-inch cutting deck is essential in making this happen. Together with the 24HP Briggs and Stratton engine, this machine is sure to get through the toughest grass. It is complemented by three steel blades to help in swift cuts. What’s more, you can achieve just the right grass height by engaging the blades in ½ inch increments from closer to the ground at 1.5 inches or cut at 4inches for tall grass. This tractor also comes with four anti-scalp wheels. They are a necessary entity to prevent the deck from scuffing the ground and damaging the area you have mowed. An electric clutch enables quick engagement of the blades when you want to make clean cuts. The hand levers provide for switching between forward and reverse when making sharp turns. You’ll also be able to manage the forward and reverse speeds. It gets better when coupled with the wide rear tires. If your land has its fill with trees, this is the power to invest in as it can make painless rounds without giving you a scare on steep inclines. When it comes to attaining uniform lawn, you’ll want to have the grass cut to the same level. But this is sometimes hard when the grass is wet or lying flat on the ground. That’s where the high lift comes in to allow sufficient airflow between the deck and the lawn. This way, the grass lying flat is lifted before being cut. The hydrostatic transmission system makes it all the more easy by allowing you to use your hand movements to control the direction. You will feel equally at home when mowing a small area or an expansive estate. The Poulan Pro P54ZX is the pride of this brand. 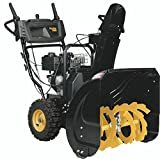 It handles complex mowing tasks in a breeze, the drive system, cutting deck and operations combine to bring an outdoor power tool that is totally outstanding. Making this investment is a plus for your home mowing needs by sparing you the time and energy in lawn maintenance. Poulan Pro has a special dedication to making sure that your lawn is sparkly. The essence of the PB20VA46 model is to make certain that you make the right investment. The pricing is reasonable considering that it packs a punch to handle large small and large properties in the same right. You’ll love that it is easy to control and in the process saving you time to complete other tasks. This is the type of outdoor equipment that converts chores into hobbies. With the fast pedal engagement system, you can control the speed in quick succession so that the machine is in sync with the area you are mowing. It comes with an electric clutch for an effortless blade engagement. The automatic drive transmission also makes it easy to drive through corners and other obstacles. You’ll not have to pause when changing the speed and mind you; it reaches a high of 8mph at top forward speed. This model is fashioned with a 20HP V-Twin motor. It is powerful enough to let the blades engage at fast speeds so you can work faster. It comes with a spring assisted deck to help in positioning the blades just the way you like them. A 46-inch cutting deck lets you mow large areas in record time seeing that you make clean passes to avoid going over the areas you have left. Better still, as you adjust the height of the deck, air inflow gets to wet and level grass. It is the remedy for getting your lawn to have a carpet-like appearance. The twin cylinder by Briggs and Stratton is always ready to go with the auto-choke starting system. You’ll not need to go through priming and choking when trying to fire up the motor. It comes with a 6-inch turn radius to assist it through rugged terrain. The reverse feature offers impeccable blade engagement while still allowing a smooth shift back to the forward direction. A 13-gauge reinforced deck offers exceptional longevity to this model. You’ll not have to spend extra on maintenance since it is virtually indestructible. You’ll be able to engage it in the roughest surfaces, but it still maintains its performance. It also comes with a robust cast iron front axle to provide the best stability for a long time. We love the craftsmanship of this mower. The operations have been made easy through the automatic transmission and the fast pedal engagement system. It frees you from fumbling with levers so you can reach every corner of your home. When you are looking for a hassle-free mowing experience make this machine you’re go-to, and you’ll never regret the choice. No, every model here needs installing the seat and steering wheel or levers for the zero turn models. Other than that for the most of the parts, it’s almost ready to go. You can receive it in the evening and still accomplish much of the mowing tasks. Isn’t that convenience at the highest? Which type of attachments can the mower take? These mowers can take on grass collection systems like baggers for an efficient method of collecting the grass clippings. They can also accommodate a mulch kit and other towable accessories. What is the fuel tank capacity for the mower? The P46ZX and P54ZX have a 3.5-gallon tank while the PB20VA46 model comes with a 2.5gallon tank. These differences are so that you can determine your needs easy and how long you want to be on the ground before a refill. Poulan Pro ensures that you can manage most of your lawn maintenance tasks with ease. The designs on this list prove the reliability of this brand plus high-performance. You can count on them to bring the best out of your lawn. If it’s not a Poulan Pro riding mower; you are missing out on greatness. I hope that Poulan pro riding lawn mower review was helpful.